Oh, the allure of a misleading headline. 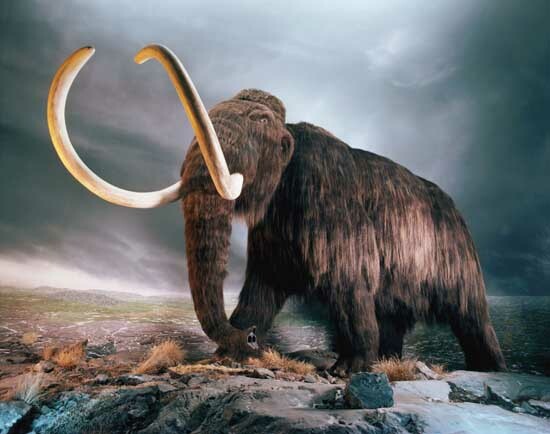 When I saw this story on BBC news, “Mammoths had 'anti-freeze blood', gene study finds,” I thought for a moment that scientists had discovered those Ice Age behemoths had secreted some glycerol-like compound into their tissues to prevent freezing. Such a finding would have been genuinely astounding because, as far as I know, that trick is seen only among certain polar fish and overwintering insects; it would have been a first among mammals. In reality, the surprise is not that the mammoths’ blood resisted freezing but rather that it cleverly continued to do what blood vitally must do: transport oxygen to needy tissues, even at low temperatures. Kevin L. Campbell of the University of Manitoba and his colleagues reached this conclusion through a nifty piece of paleogenomic molecular biology, as they reported in Nature Genetics. Their technique’s fascinating potential to help biologists learn about the physiologies of extinct creatures has already drawn considerable attention, but the mechanism of the hardiness of the mammoths’ blood also helps to highlight a common way in which evolution innovates. Mammoths display obvious features that must have helped them stay warm in the brutal subzero temperatures of the Pleistocene ice ages, such as long, shaggy coats and small ears. They may well also have had less obvious ones, too, like the arrangement of blood vessels in the legs of caribou that allows countercurrent exchange to minimize the loss of body heat from their legs while they stand in snow. Nevertheless, Campbell had wondered about whether the mammoths’ blood might have been adapted, too, because of hemoglobin releases oxygen into tissues only sluggishly at low temperatures. By extracting the hemoglobin gene from DNA in well-preserved mammoth remains and inserting it into bacteria, Campbell and Alan Cooper of the University of Adelaide were able to replicate samples of the mammoth’s hemoglobin. And sure enough, in subsequent tests, the resurrected hemoglobin proved to release oxygen much more consistently across a wide range of temperatures—even glacially low ones. Perhaps it sounds surprising that something so fundamental to mammalian physiology as its hemoglobin chemistry would be subject to evolutionary revision. Surely the mammoths might have survived the cold just as well by evolving more hair or thicker insulation. Yet hemoglobin chemistry is actually a feature particularly well suited to modification—and that has been modified many times throughout evolutionary history. The key is that the genes making the globin proteins have leant themselves to frequent duplication throughout evolutionary history, which opens up the opportunity of variation among the copies and specialization in their activities. Humans, for example, have several different types of globin genes (designated alpha, beta, gamma and so on) on chromosomes 11 and 16 that may be used in various combinations to manufacture variant forms of the tetrameric (four-chain) oxygen-transport protein in red blood cells. For our first 12 weeks or so in utero, our bodies make embryonic hemoglobin, then switch to fetal hemoglobin, which can continue to be a major component of newborn babies for six months. Mammalian fetuses need hemoglobin that takes up oxygen very avidly because they need to steal it away from their mothers’ blood as it circulates through the placenta (see graph). So fetal hemoglobin does not respond to a chemical (2,3-bisphosphoglycerate) that reduces the oxygen affinity of adult hemoglobin. Fetal hemoglobin has actually been the salvation of many adults who suffer from sickle-cell anemia. These people make a defective form of adult hemoglobin that distorts their red blood cells into the elongated, sickle shape that gives their condition its name; these sickle cells can clump together and block blood vessels, leading to painful and frequently fatal complications. A treatment for sickle-cell anemia, however, is to give a patient hydroxyurea and recombinant erythropoietin, which stimulate the body to begin making fetal hemoglobin again, alleviating some of the problems. Of course, sickle-cell anemia is itself the result of a mutant variation in the copies of the genes that make the beta subunit of hemoglobin. As is well known today, the genetic trait for sickle cell seems to have originally taken root in populations in sub-Saharan Africa and other parts of the world where mosquito-borne malaria is endemic: people who are carriers of the trait are somewhat more resistant to malaria infection. The prevalence of sickle-cell genes in those populations therefore may represent an adaptive, evolved response—albeit it a cruel one—to the harsh burden of malaria. Indeed, the genetic blood disorders called thalassemias, which are prevalent in many Mediterranean ethnic groups, may similarly represent the result of natural selection for improved survival against malaria (although unlike sickle-cell anemia, which involves an abnormal hemoglobin, thalassemias are caused by underproduction of a normal hemoglobin). Looking outside the human species, one finds that the globin proteins have a staggeringly wide range of forms and chemistries, representing an incredible amount of evolutionary experimentation that long preceded the development of our species’ own tidy system. Horseshoe crabs aren’t aristocrats but they are literally blue bloods, with a blood pigment that carries copper instead of iron. Sea squirts have a green blood pigment based on vanadium. Many animals (including humans), in addition to some form of hemoglobin, also have myoglobin, a large globular protein that helps muscle tissue hang onto the oxygen it needs while working. (Myoglobin is the reason that meat is red, my fellow steak lovers.) Some dopaminergic neurons and glia in the brain also seem to contain hemoglobin, possibly to insure the brain’s own access to oxygen under suffocating conditions. And hemoglobin itself also seems to have functions quite apart from oxygen transport: its antioxidant properties and interactions with iron seem to be used by cells in the kidneys and immune system. All this variation suggests that hemoglobin genetics might not have been such an odd target for natural selection in the evolution of mammoths: it is an extremely malleable protein with diverse capabilities, and because organisms often contain multiple copies of it, variants can creep into a population and survive long enough to be tested by selection. In fact, another example not unlike the mammoths was reported in the scientific literature last year. Jay Storz of the University of Nebraska-Lincoln and an international team of collaborators reported last August in the Proceedings of the National Academy of Sciences on their genetic comparison of deer mice living in lowland prairies and in the mountains. The mice were identical in every respect except for just four genes—all of which boosted the oxygen capacity of the mountain mice’s hemoglobin. Mammoths and deer mice may be at opposite ends of the spectrum for mammalian size, but similar principles of evolution applies at all scales.